Yesterday we went to see Wasps vs. Worcester at Adams Park. I think that anyone who is bothered by the score will now know that Wasps won 19-14. It was a close run thing, worryingly so given that Worcester are languishing at the bottom of the premiership, having only recently won their first games. 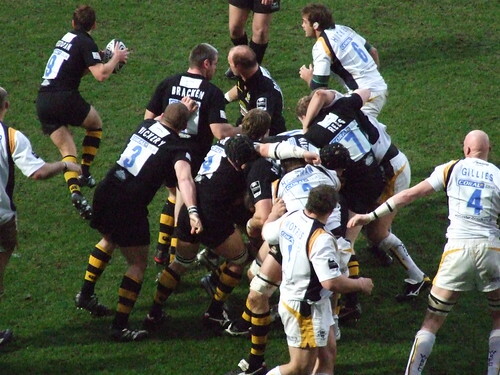 Wasps can be frustrating that way, excellent one week, and then struggling the next. For most of the first half, Worcester were in the lead, and were piling on the pressure right up until the final whistle. There could easily have been a last minute try from them. The new scrum rules seemed pretty smooth, there wasn't a noticeable decline in the impact of the 'hit' - but this will need to be checked over time. That's one concern out of the way. As someone new to the game, there are still aspects which elude me, for instance, when a ball is kicked into touch, sometimes the kicking side gets the lineout, and sometimes the defending side does - I need to work that out (or just look it up!). Still, it's an enjoyable spectacle, even if things are sometimes a bit mysterious!